Biomedical Data Journal (BMDJ), ISSN 2367-5322, e-ISSN 2367-6477‏, is an open access journal aiming to facilitate the presentation, validation, use, and re-use of datasets, with focus on publishing biomedical datasets that can serve as a source for simulation and computational modelling of diseases and biological processes. Edited by Alessandro Pingitore, Francesca Mastorci, Giorgio Iervasi, CNR - Institute of Clinical Physiology, Pisa, Italy. 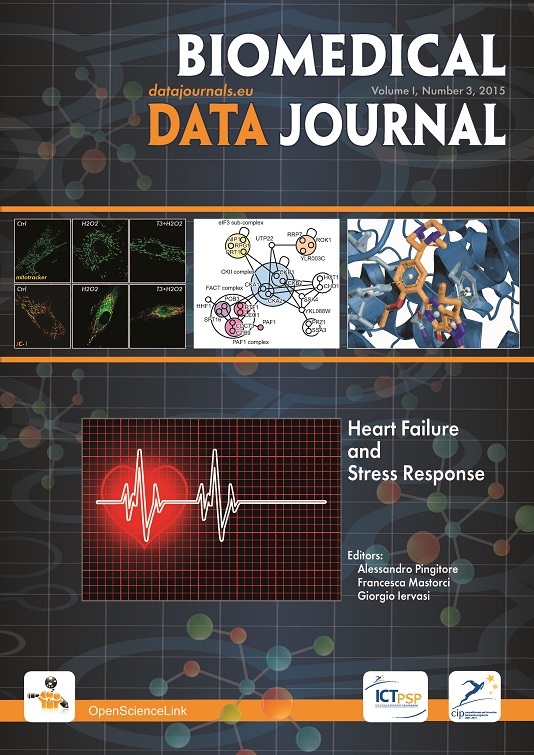 With the current special issue on HEart FAilure and STress Response (HEFAST), BMDJ introduces a holistic approach to the publication, sharing, linking, review and evaluation of heart failure (HF) studies, based on the open access to scientific information. In cardiology research this is critical in order to promote interoperability between different centres through integration of published biomedical datasets. In particular, this can serve as a source for simulation and integration of computational technologies of diseases and biological processes. It is increasingly recognized that the integration of a variety of biological and medical research data to produce or refine disease models using advanced statistical, computational and mathematical approaches could facilitate the understanding of biological systems’ complexity. BMDJ 1(3) presents five data papers and the respective experimental and clinical datasets. Pingitore A, Mastorci F, Iervasi G. Heart Failure and Stress Response. Biomed Data J. 2015;1(3):33-35. Mourouzis I, Mantzouratou P, Pantos C. A Dataset from Echocardiographic Assessment of Cardiac Function in Mice after Myocardial Infarction. Biomed Data J. 2015;1(3):37-40. Ferrari G, Di Molfetta A, Zieliński K, Fresiello L. Circulatory Modelling as a Clinical Decision Support and an Educational Tool. Biomed Data J. 2015;1(3):45-50. Vassalle C, Vannucci A, Mastorci F, Battaglia D, Landi P, Di Cecco P, Carpeggiani C. Anaemia as Predictor of All-Cause Mortality in Patients with Systolic Dysfunction. Biomed Data J. 2015;1(3):51-55. Di Bella G, Aquaro G, Mastorci F, Pingitore A. Prognostic Role of Cardiac Magnetic Resonance Imaging in Patients with Previous Myocardial Infarction: A Clinical Dataset. Biomed Data J. 2015;1(3):56-60.